4 Is Horn For You? When Horn arrived on that other mobile platform a couple weeks ago, it was met with plenty of praise. 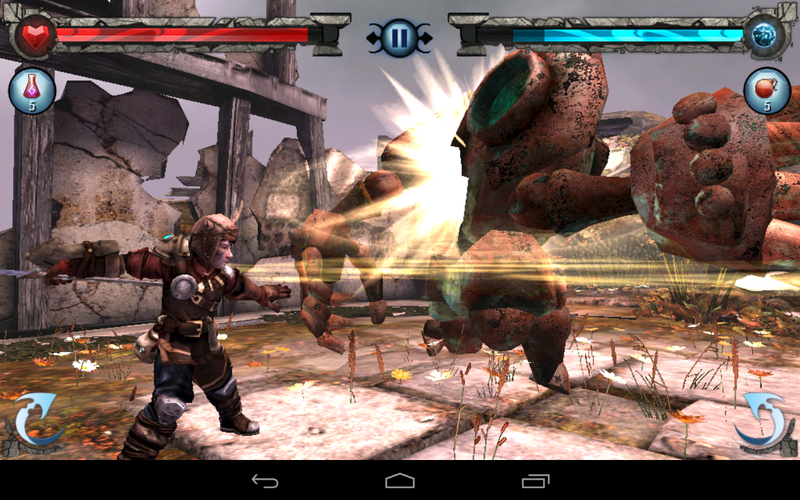 Now Horn is available on Android, and it still stands out among all categories of games. Horn is built from the ground up with an awareness that it will be played on a touchscreen device, and it shows. 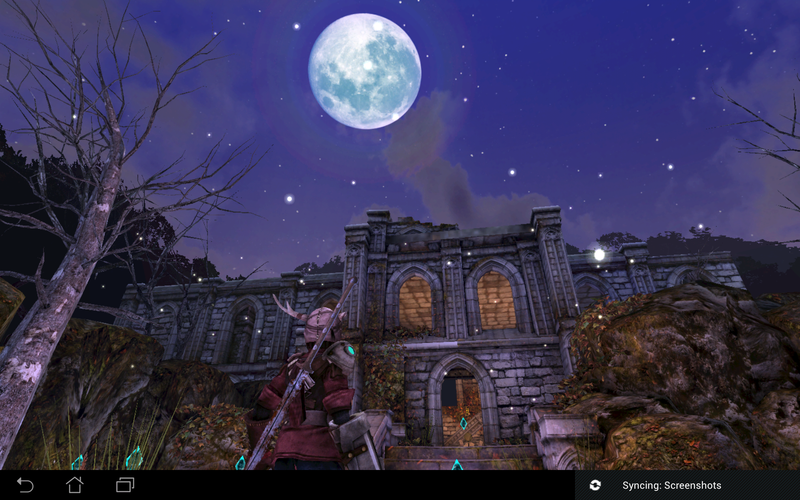 From the impressive graphics to the unique story, Horn has a lot to show off. Let's dig in and see if it's a must-have. You play as Horn, the blacksmith's apprentice who awakens one day to find everyone in the village has been transformed into mechanical monsters by a curse. In this game you have to journey through what was once your home, but is now little more than a ruin to save the realm. 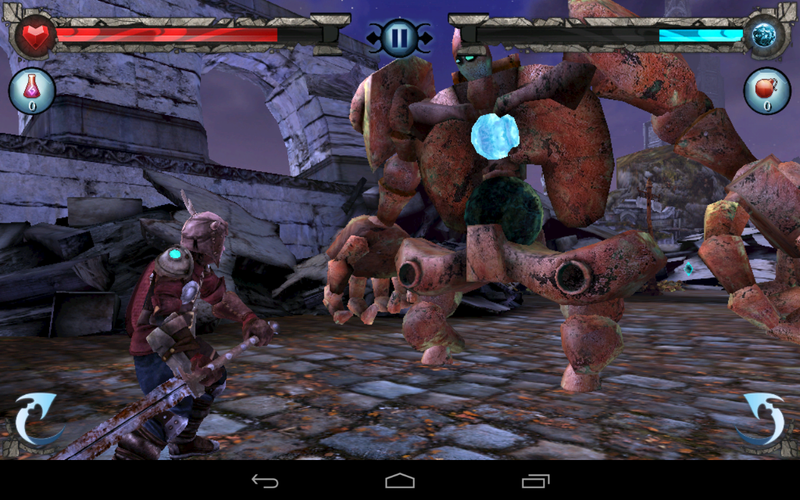 Right from the start, you begin encountering the giant mechanical golems known as Pygons. The Pygons are not too friendly, and quite nearly impervious to your rusty old sword. The game does a very good job early on making sure you understand the rules of the world. I often find that these big sweeping games go off the rails very early by making you figure too much out on your own. The first few minutes in Horn are basically a guided mini-quest designed to get you familiar with controlling your young avatar. 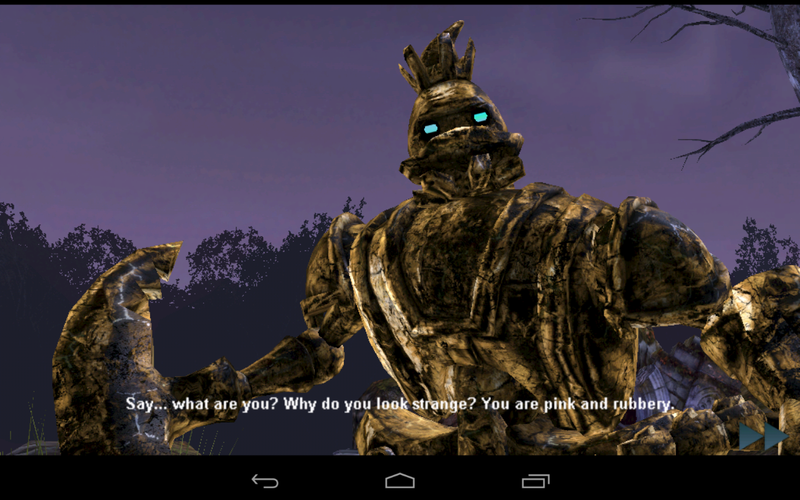 Through a series of cut scenes, you realize that by defeating Pygons, you can return them to their human state. When you defeat a Pygon, you get a Pygon Seed, which can be used to open up more areas of the game. It would not be accurate to call Horn a fully open-world game. It is linear, but it is perhaps cleverly disguised as more open than it is. You explore a central hub, but start individual missions where most of the action takes place. I found the story to be good, but it does take a bit of a back seat to the hack and slash later on. There were a few twists and turns that kept the tale moving along, though. The puzzle elements help add to the depth of Horn. I won't say that they are incredibly challenging, but you might have to do a little thinking to advance past a few of them. Many puzzles have to do with learning songs with your horn (yes, the kind you play music on) or shooting arrows. 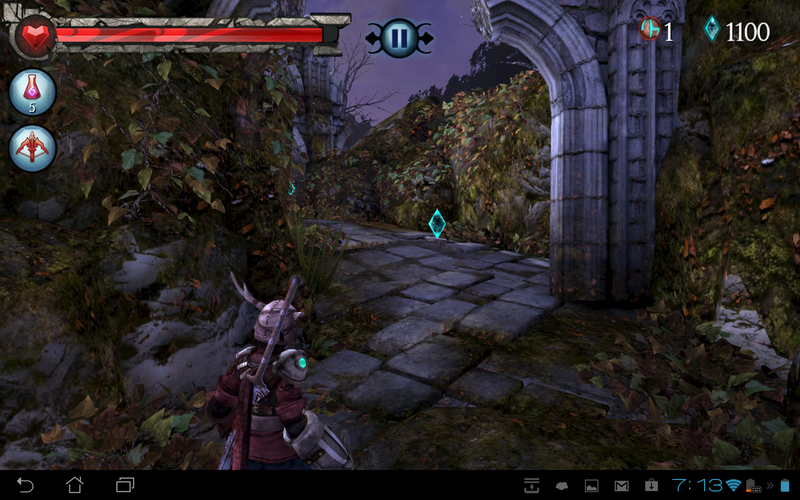 Horn is a third-person game, but unlike most other games of this sort, Horn does not rely on dual thumbstick controls. 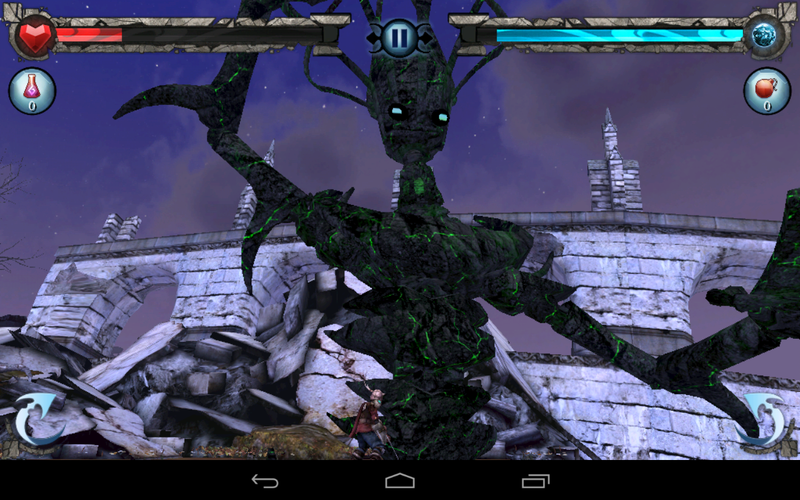 Instead, everything is based around taps and swipes, much like Phosphor's other game, Dark Meadow. To move, all you have to do is tap anyplace on the ground around your character. This has the advantage of being dead simple and fairly accurate, but it limits your maneuverability. There is no way to walk backwards because you can't see the ground behind Horn. If you walk into a corner, you have to turn around, then walk away. Speaking of turning, it's accomplished with a simple swipe across the screen. There are some other interactions that use similar gestures, but the game knows when those times are. For example, you jump gaps by tapping the other side, but if you're left hanging off the edge, you swipe up to pull yourself to safety. 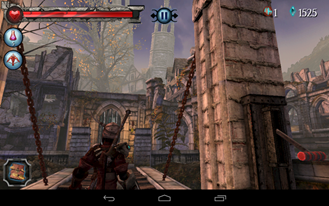 Walking along narrow ledges also requires you to swipe to the side to walk, and up to maintain your balance. When the time comes for fighting, Horn switches to a special set of controls. Tapping no longer moves you to that point, but tapping on the left and right arrow buttons will dodge in that direction. Use these to avoid getting smacked by a Pygon. 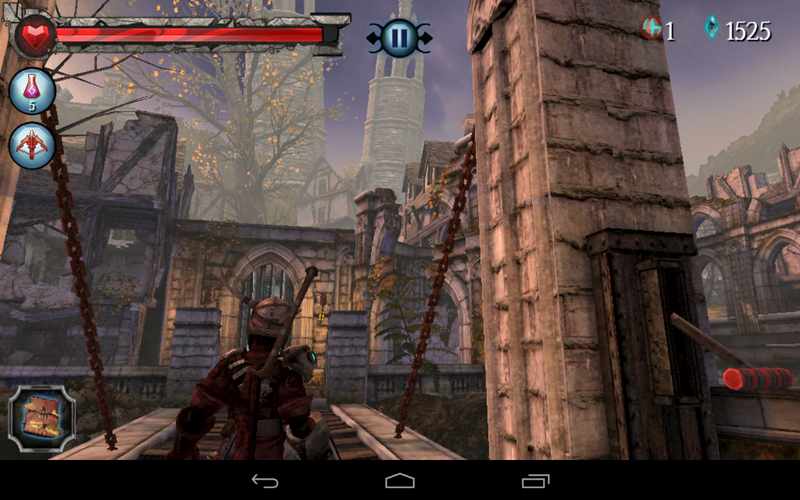 When you have an opening, start slashing your sword by swiping across the screen. The weapon will follow your input exactly, so take note of any weak spots and aim for them. 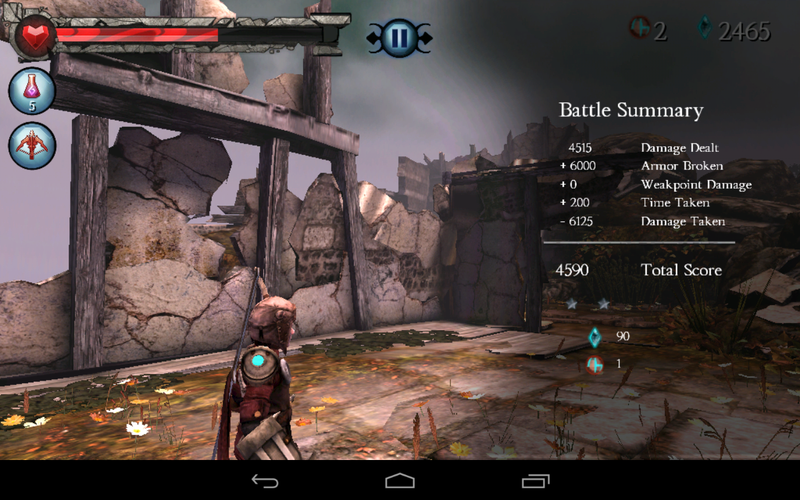 The combat controls are probably the best part of Horn, but most of it works well enough for me. The best thing about the overall control scheme is that it's immediately accessible to lots of users. You can also play most of the game one-handed, which can be helpful. 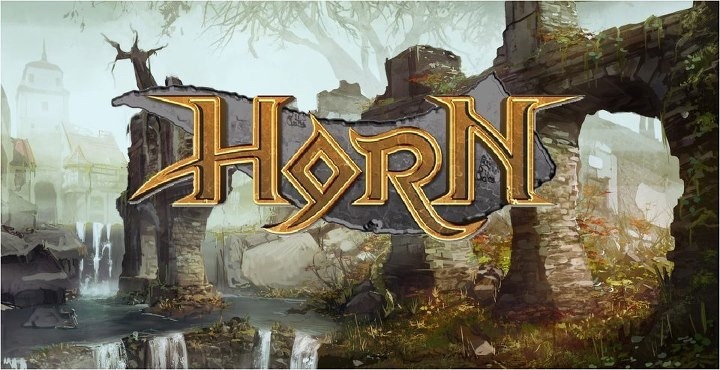 Horn is reputed to be a very impressive game from a graphical standpoint, but how does it fare on Android? I will say that it looks and performs better than many games that attempt barely half as much. 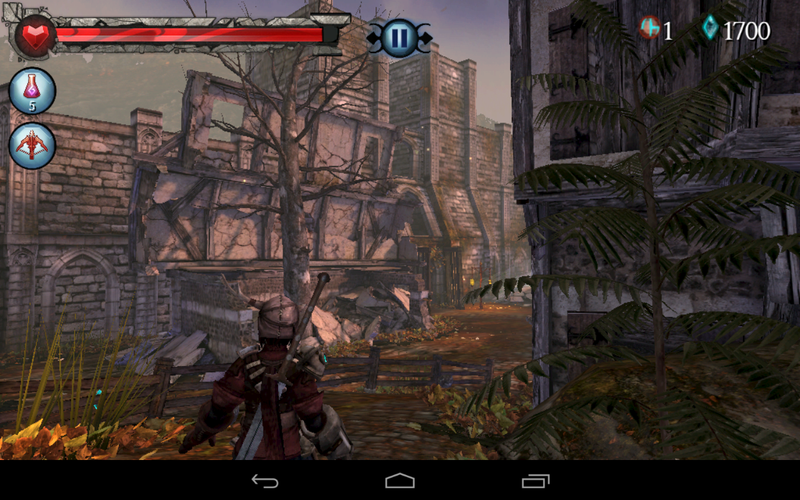 When I installed on the Nexus 7, the frame rate was choppy and required a device restart. Since then, it's been very smooth with maybe just an occasional frame drop. The textures look good, but not great. There is also some aliasing along the edges of objects. 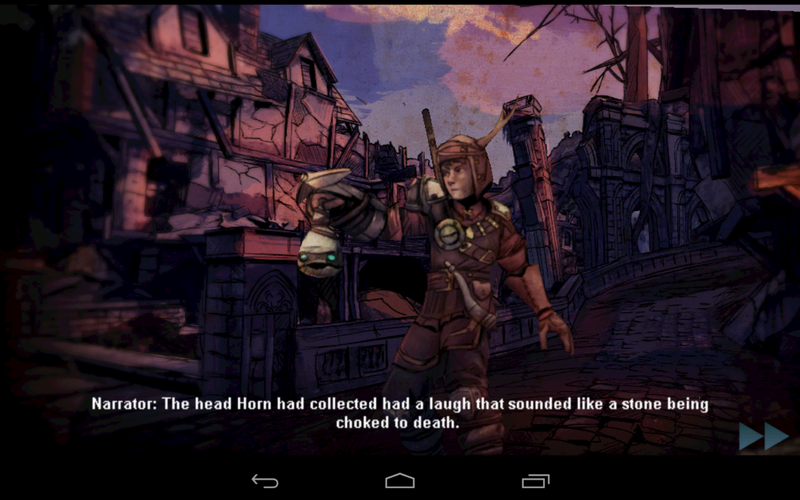 I can't fault Horn too much for a few graphical foibles because it's still amazing looking. 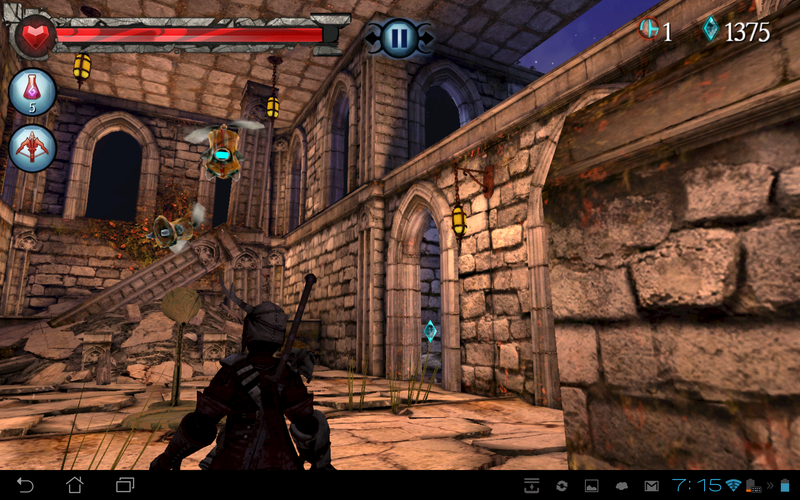 The environments are incredibly detailed, and vibrant. Some of the press shots for the game seem to show even better graphics than I'm seeing now, so hopefully some improvements are coming. 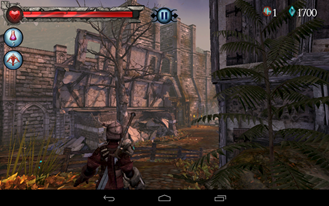 The game has both Tegra and non-Tegra graphics, so some devices might not look as good. Even some of the more aesthetically pleasing games tend to make some real sacrifices when it comes to sound, but Horn is not one of them. There are ambient sounds that draw you in and make you feel like part of the world. The voice acting is also really phenomenal. The developers did not just stay late to record the lines themselves. The dialog is written well, and has some fun whimsical humor. I think Horn is a very good game. The linear nature of the gameplay does start to become obvious the longer you play – you notice some repetition. However, it's repeating good stuff, so I can't complain much on that count. 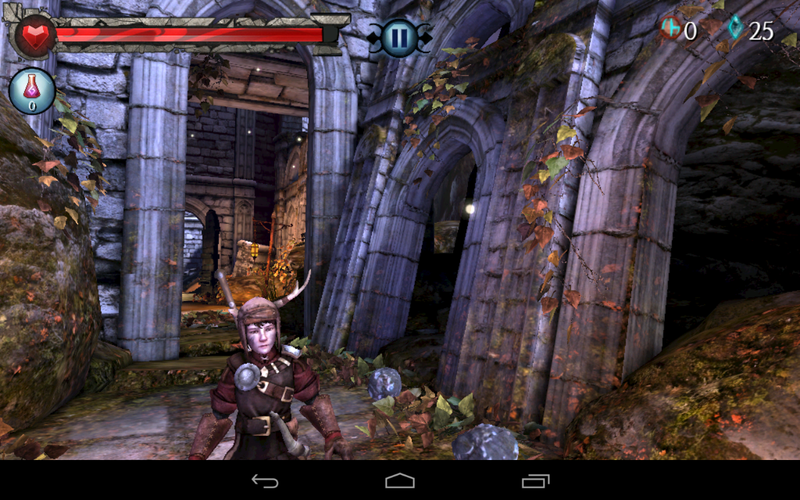 Be aware that there are in-app purchases in Horn, but they are tucked away in the equipment screen. I don't think you need to use these to advance, but they're there if you want to speed things up. Horn definitely lives up to its reputation as being very lovely. I feel like it can do more, though. The developer's other game, Dark Meadow, looks better in my opinion. However, there's no doubt that the controls, story, and voice acting are all top notch in Horn. If you like action-adventures of any sort, check Horn out in the Play Store, so long as you can handle its massive 1.8GB download size and $7 price tag.